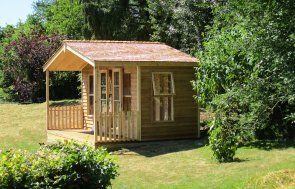 Offering a lovely view of our customer’s picturesque pond, this Blakeney Summerhouse has been installed in Bassingfield, Nottinghamshire, to be used by the customer as a summer garden retreat. The Blakeney is a chalet-style summerhouse, perfect if you want to recreate a beach-hut feel in their back garden, and it is one of the two summerhouses in our range (the other being the Morston) that can be designed to be either as simple as possible, or as feature-packed as you want, dependent on your requirements. Our Heavy duty felt has been used on the roof, which is the standard roof covering we use on the Blakeney, and the customer wanted the colour of their summerhouse to match the colour of the door to their garage next to it. The colour the customer chose is Lizard, which is a natural green colour from our Valtti paint range: Valtti is an opaque, multi-layered paint system with a long re-decoration cycle. 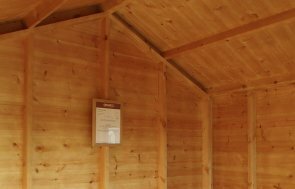 For more information about our Blakeney Summerhouse, you can call us on 01760 444229, Contact Us online, or come and visit one of our Show Centres to see the quality of our buildings for yourself and talk to our helpful building experts.